The future of fish farming? May 24, 2013: Here’s my Guardian story on Gigha Halibut, the onshore farm producing gorgeous, chemical-free fish – at a premium – on Scotland’s West Coast. It got interesting reaction from the salmon-farming industry. Some of it not even rude. See below. There are stealth bombers cruising through the huge swimming pool, flat-fish the size of doors, changing colour as you watch, from matt black to pebble-and-sand. Fish farmer Bob Wilkieson pulls one up in a net. It is 7kg of dense, thrashing muscle, utterly alien with its twisted face and deltoid wings. These are four-year-old Atlantic halibut, and they may be the future of fish-farming: raised onshore, without chemicals and on organic feed. Unlike the flabby, slimy stuff we have come to accept as farmed salmon, this halibut is lean and far better to eat – in terms both of ethics and taste – than its wild brothers. I went to Gigha, a little island off Kintyre, for a taste. Smoked Gigha halibut, which has kept popping up on menus since its launch 18 months ago, is worth the trip. Sliced thin, with a little lemon, its sweet, gently oaky taste (Gigha’s smoke-recipe using whisky-barrel chips was designed by the acknowledged master, Allan MacDougall, late of the Loch Fyne smokery) has high-end chefs queueing up for some of the strictly limited production. As the tiny ferry pushed through the waves and mist, marketing officer Amanda Anderson was busy on the phone to Raymond Blanc’s Le Manoir aux Quat’Saisons, which has added it to its daily breakfast menu. This is the latest in a line of extraordinary fish-production enterprises in the west of Scotland, born, like so much in that part of the world, of hard work, original thinking and a sizeable heap of taxpayers’ money. EU cash originally built the network of huge tanks and seawater pumps for a salmon farm on this stretch of rocky coast. Now it hosts 6,000 halibut until they are at marketable size. Gigha’s community wind turbine provides the power to run the machinery. Alastair Barge, managing director of Gigha Halibut, was one of the original salmon farming entrepreneurs but he now concentrates on fish farming techniques that cause less environmental damage. He showed me one clever innovation, farmed wrasse, a pretty striped fish that will eat the sealice that infest farmed salmon while swimming alongside them – a better solution than pumping chemicals into the cages. Wrasse are already used in fish farms, but catching them in wild is threatening their stocks. Barge spent 20 years working out how to raise halibut from microscopic to “car bonnet” size. Since 2007 Gigha has been providing the award-winning fresh Atlantic halibut to the wholesale fish trade, easing the pressure on a wild stock that has nearly collapsed. But, with most wild stocks of fish under extreme pressure, “aquaculture” is the only way most of us will be able to eat fish in future; half the world’s seafood is already farmed, most of it for people in Asia. Keeping farmed fish out of the sea bypasses some of its key problems. (That’s why, in order to get a licence from US authorities, the new GM super-salmon will be farmed in the hills of Panama). On-shore farms mean no escapes that can contaminate wild stock, and less risk of disease. “Our veterinarian and medical bill is zero, because we keep densities so low,” says Barge as he shows off the darkened tanks where the halibut eggs hatch, in temperatures that mirror the depths of the Arctic ocean. “The feed is offcuts from a certified sustainable fishery, with a vegetable component.” Seals can’t get at the fish in their tanks, so they’re not shot, a sadly common practice in sea fish-farming. And the farmed halibut die more happily too. They are stunned beside their tank, a few seconds out of the water, rather than hauled out of the sea by net to die on a trawler deck. So why aren’t all fish farms like this? A key reason is cost. Salmon-farming moved into the ocean 30 years ago because water-born cages were cheaper; what was once a luxury fish is now as cheap as chicken. A few years back, a Shetland enterprise developed excellent organic farmed cod – much better than wild cod that may lie on ice in a trawler’s hold for 10 days. But though it went into supermarkets as “no-catch cod”, the premium price put consumers off and the business folded in 2008. 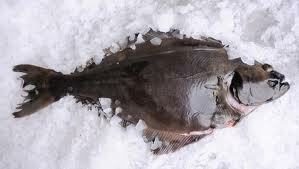 In whichever way halibut farming is presented to the media, it is not the future of aquaculture. Land based systems, even those powered by community wind turbines, will never be commercially viable except if the fish grown can command a high price. 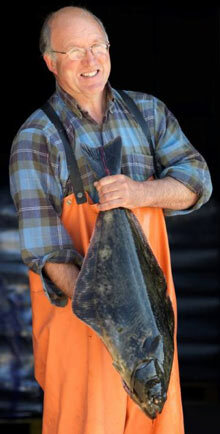 Halibut may fall into this category but even without the farmed option, halibut was never in huge demand. Past attempts to farm the fish failed because the small wild fishery met the current demand. Alistair [Barge of Gigha Halibut] produces a small amount of fish and another farm in Norway produces some more but I don’t think that there will be any further growth in production. There simply isn’t the demand. There is a belief that similar land based systems can be used to grow salmon but this is just unrealistic. Those promoting this concept have a different agenda which is not a good enough reason to proceed. My understanding is that the Scottish unit proposed by ‘Fish From’ is having great difficulty raising investment. Growing fish in tanks because anglers want it so is not a good enough basis to persuade the money men to make a commitment. Fish From are talking the talk but there is a long way to go before they cut the first sod. You say salmon farms opted for the sea because it was cheaper. That is incorrect. Tanks were never considered in teh early days because the sea was seen as the natural option. In Scotland, salmon farming was originally developed by companies who thought that they were following the green choice. You write that many environmentalists hate fish farming because of the damage it can do but the way that they go on you would think that salmon farming is another Bhopal. Yes, there is a build-up of organic matter below salmon cages but the footprint is tiny and the sea bottom does recover. By comparison, environmentalists rarely mention the millions of tonnes of plastic waste chocking up the sea. Yes, salmon sometimes get disease. So do wild fish and they die out of sight. Yes, there is an issue with sea lice but the issue is on salmon farms. There is little evidence to show that sea lice impact on wild fish. I know there are scientific papers that say they do but the authors seem to have a vested interest and equally, there are papers that say the opposite. The greatest critics of salmon farming are the anglers organisations (22,450 wild adult salmon killed in the name of conservation last year). There has been a great deal of coverage from them in the press over the last few days mainly claiming that salmon farming is responsible for a decline in wild salmon numbers. I will say what I asked them. Name me a river on the west coast in which the salmon are in decline. Their usual response is to quote a paper from RAFTS written in 2011 that shows salmon populations on the west coast are declining faster than on the east coast. This is just their spin on the official data. I prefer to look at the catch data from Marine Scotland and not one of the rivers is showing any sign of decline. Far from it, last year anglers on the Garynahine caught a record number of wild salmon despite the fish having to swim through a gauntlet of six farms. The west coast Carron also produced a record number of fish despite the fish having to swim through Kishorn (in the news today). Guy Linley Adams of the S&TA told the BBC that farms must be moved and the one infamous example is the farm in Loch Ewe. This is based on the fact that the river Ewe and Loch Maree system collapsed in the 1980s’. I have personally spoken to a retired estate worker who still lives on the banks of Loch Ewe and who used to work the salmon nets who is quite categorical that the salmon disappeared from the Ewe at least two years before the salmon farm was built in the Loch. The cause of the collapse he says was the change to inshore fishing regulations that allowed boats to fish in the loch for mackerel and took everything they could including salmon and sea trout. At least the salmon have returned because the mackerel never did. The river Ewe has produced some good fishing in recent years despite the presence of the farm. Salmon farmers don’t reach for the medicine bottle or the (fertiliser – or whatever you meant) unless it is a last resort. Yes, not every farm is perfect in the way it operates but there are controls in place to police this. Equally no farmer likes shooting seals and certainly only do so as a last resort. The salmon industry is lambasting for seal deaths but more seals were shot by those protecting wild fish interests (including anglers) than by farmers. Yet all the news is about salmon farms. Your memory of No Catch is incorrect. No Catch collapsed in 2008, five years ago [corrected]. Companies moved into cod farming because they believed the hype from the environmental lobby that cod stocks had collapsed. The reason that it didn’t work wasn’t so much the farming but the questionable business practises. The experience of companies in Norway was that they couldn’t compete with the still available wild catch. Alistair [Barge of Gigha Halibut and Otterferry] is doing a great job but it is not the model of future aquaculture industry. That lies elsewhere. My personal view is that there may well be a small environmental price for aquaculture but it is definitely a price worth paying. I should state that I believe in aquaculture. I spent five years working for Oxfam in East Asia, and I’ve seen what a good use of resources it can be, and how crucial it is for nutrition, particularly for the poorest. The more fish we farm the better we all will be. But the business is 1000 years old in Asia, they say, while just in its infancy on Atlantic coasts. I think it needs to be done better. I completely accept that that currently that is not economically viable. I agree that there will always be a small environmental price to pay, and that can be worth it. However, these issues are the same in many sorts of intensive farming – but it doesn’t mean consumers have no right to push for better. The food system is a mess. I am sure food generally needs to get more expensive, and retailers need to give back more of their take to producers – rather than just talk big about good practices and environmentalism. But, it will change. A glance at what’s going on world wide shows that we’re in for all sorts of shocks, food-price-wise. And aquaculture could become really important in nourishing a future Britain. I’ve spent a lot of time in Shetland and on the West Coast. I’ve seen salmon farming at its best and worst, and I’ve seen the good and bad it can do. I know there’s been good news recently on wild fish catches. But I was in Loch Gairloch helping with the seatrout lice census last month, too. With fishing there’s always another side to the story. But I do think the Barge operation is to be celebrated. Any tweak in a system that allows producers to catch a premium is – like live prawn creeling – and I do think your industry needs to get out of the bargain basement. That would be good for everyone. I’m really hopeful about salmon farming.. Look at the improvements you fish farmers have made – like the drop in the conversion rate, and the rise of vegetable feeds. The better safety record. The end (I hope) of antibiotic use. You’ve only been doing it 40 years and the trade has changed massively. Maybe in a few more, there’ll be a salmon farming method I can applaud! Please do add your views in Comments.